I wanted to tell everyone about something that I have used for the last three years. I purchased it because we have very limited space in our 20 foot motorhome, so most everything needs to have multiple uses. It is the Kuhn Rikon 4200 12-Cup 4th Burner Pot. 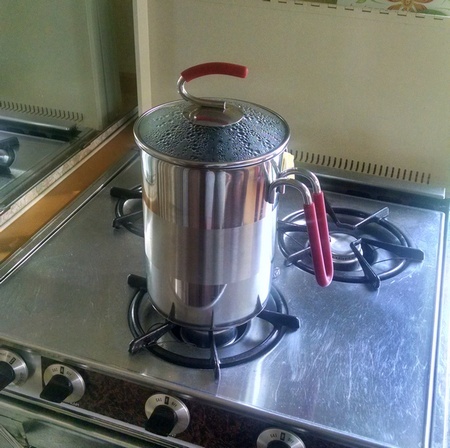 Here is a picture of my Multi-Pot making a batch of sweet tea. I just love this thing! Having grown up in the South, we love sweet tea (although we make it with Stevia instead of sugar) . I use this to make 12 cups of sweet tea at a time. Once brewed and cooled I pour the tea into mason jars with pouring lids and pop them into the RV fridge. I also make coffee in the mornings and hot tea. Boiling eggs is also a breeze. There are so many uses. It is stainless steel, so it never rusts. The base handle and the lid handle stay cool, too. There is a pouring spout on the pot with a strainer lid and a steamer basket insert. I love it so much, I take it out of the RV and use it at home, too. Try it out, you won’t be disappointed! You can order the multi-pot and/or the Mason jar lids at Amazon through these links. This entry was posted in Articles, Product Reviews, That Rolling 70s Show by Monique. Bookmark the permalink.